Do hot, humid, sweaty days making you feel a bit like a wilting flower? A cold shower helps a lot. Even more, make sure you are getting enough fluids to keep yourself cool. In the summer, we need a lot of extra to stay hydrated. How much? Depends on your age and what you are doing. Everyone’s different. Common signs of dehydration include: dry mouth, thirst, fatigue, dizziness and headaches. Here at Harvest Home we’ve found a lot of delicious, easy ways to hydrate with flavor. Start with what you eat: Snack on summer’s fruits and veggies, like watermelon, cantaloupe, cucumbers, celery and tomatoes. They all have high water content (did you know watermelons are 92% water?) and tons of nutrients, making them the perfect hydrating snack. Take the “boring” out of water. Add refreshing flavor with herbs, slices of fruit or even veggies and store in the fridge. See tips below. Refresh with a new iced tea flavor. 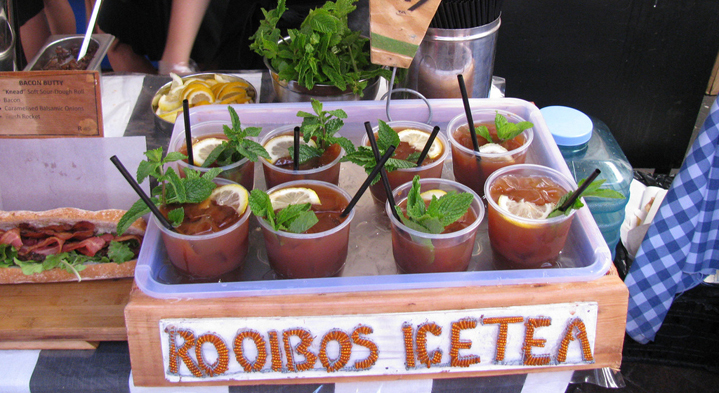 Our favorite hot weather drink is African red tea (Rooibos Tea) poured over ice! Rooibos tea is naturally caffeine-free and has tons of antioxidants among other benefits. See recipes below or click HERE. Adding fruit and spices or using different teas can create a whole new kind of refreshment. Bring 8 cups of water to a boil & add 8 tea bags. Let sit for 10 minutes. Remove the tea bags and chill. Add peaches & mint to tea and store in the fridge. Remove the fruit after one day. Ginger Root Tea: Great for digestion and stress-relief. Plain: Take a 2 inch piece of ginger root and crush it. Toss it in boiling water and simmer it for 15 minutes. Pour over ice and enjoy! Minty Green Ginger Root Tea: Put 2-3 green tea bags in a teapot with 2 inches of grated ginger & a few sprigs of mint. Fill the pot with boiling water. Let sit for 5 minutes. Pour over ice. African Red Tea (Rooibos): A refreshing mouth feel you can’t beat! Icy cold water with a hint of flavor can keep you cool & refreshed…and save lots of money! Plain or flavored, keep a large pitcher of water in the fridge so it’s cool when you need it. Combine all the ingredients in a pitcher and stir around. Crush the fruit a little or let it float on the top. Comment below, follow up on social media and join our mailing list for healthy recipes and tips on how to prepare your meals! Newer PostSNAP Up the Rainbow!